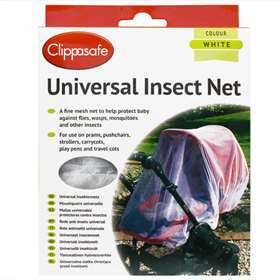 Clippasafe Pram And Pushchair Universal Insect Net is a fine white mesh net to help protect your baby against flies, wasps, and other insects. Mesh net to protect your baby against insects. Also for use on Carrycots, Strollers and Play Pens. Raise hood fully. With the printed tabs to the side, drape the net over the both the hood and body of the pram or carrycot. The elasticated edge of the net fits around or under the pram body. Either raise and lock the hood, or fit a suitable sun canopy which will adequately support the net well away from your baby's face and upper body. Drape the net over the hood or canopy with the printed tabs to the side. Arrange the net so that no gaps are left between the elasticated edge of the net and the seat, hood or canopy. Due to the design of some pushchairs, it may be necessary to place a folded towel or blanket along the edge of the seat to avoid leaving gaps between the seat and puschair frame. If the play pen has side walls that will prevent insects from getting in, this net can be draped over the top of the play pen for added protection.